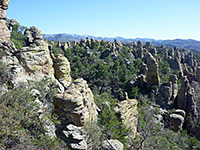 The Chiricahua National Monument map shows the location of all trails. Big Balanced Rock 1.0 150 One of the largest balanced rocks in the national monument overlooks the upper end of Sarah Deming Canyon, and is reached by a fairly level trail that crosses open, mostly treeless ground, partly burnt in a recent wildfire. There are good views along the way towards distant peaks, especially to the south. 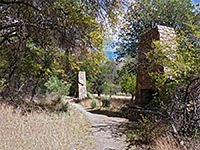 The three-way junctions at either end are with Heart of Rocks and Sarah Deming trails to the west and Inspiration Point/Ed Riggs trails to the east. Bonita Creek 0.5 level This short, easy path winds through grassy, partly wooded surroundings on the south bank of a seasonal stream; good habitat for wildflowers and animals. An optional 0.2 mile loop explores similar terrain further west. Echo Canyon 1.6 450 The Echo Canyon Trail is perhaps the most popular path in Chiricahua National Monument, following a rocky ridge past many huge volcanic boulders, some of which form enclosed, cave-like spaces (the Grottoes, after 0.5 miles) and a narrow, sheer-walled passage (Wall Street, after nearly 1 mile). 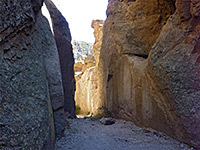 The path then descends to the forested floor of a sheltered valley (Echo Park), which contains a few seasonal pools, then rounds a corner to a grand viewpoint high above two deep ravines, and on to a junction with the Hailstone and Upper Rhyolite Canyon trails. Ed Riggs 0.9 380 This trail forms part of the Echo Canyon Loop; starting either at Massai Point or the Echo Canyon parking area, the path descends gradually along a forested ravine, to a three-way junction with the Hailstone and Mushroom Rock trails. Hailstone 0.8 100 The mostly level Hailstone Trail traverses the steep slopes on the north side of upper Rhyolite Canyon, giving close-up views of many volcanic pinnacles. 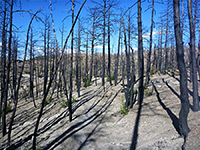 The surroundings are quite exposed, hot in summer, and the vegetation includes desert plants like agave, yucca and cactus. Heart of Rocks 1.1 (loop) 250 The shortest approach to the Heart of Rocks is via the Ed Riggs, Mushroom Rock and Big Balanced Rock trails (3.1 miles); this latter ends at a three-way junction, one route being the start of the 1.1 mile loop through some of the most spectacular pinnacles and eroded rocks in the park. 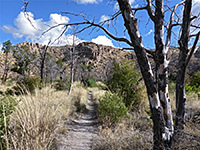 The path descends a little then splits, whereupon each branch climbs quite steeply, eventually giving good, long distance views of Rhyolite Canyon to the north. Inspiration Point 0.5 100 Inspiration Point is an overlook on the south side of upper Rhyolite Canyon, reached by a half mile spur trail over a mostly treeless plateau, starting at the junction of the Big Balanced Rock and Mushroom Rock trails. Lower Rhyolite Canyon 1.5 600 The lower section of Rhyolite Canyon provides the course for a straight and not too steep trail that encounters cool, oak woodland all the way, starting in the west at the visitor center and ending at a junction with the Sarah Deming and Upper Rhyolite Canyon trails. Massai Point 0.5 (loop) 50 The park road ends at 6,870 foot Massai Point, often a very windy location, but providing fine, 360 degree views over the surroundings. A short, partly paved nature trail loops through the lightly wooded surroundings, and has informative notices about the local plantlife. Mushroom Rock 1.2 600 The small eroded formation of Mushroom Rock is situated just below the rim towards the thickly wooded upper end of Rhyolite Canyon, quite high above the trail through this part of the ravine. The rock is not really an attraction in itself; most people use the path to reach Inspiration Point, Big Balanced Rock and Heart of Rocks, via continuation trails. Natural Bridge 2.4 400 Although just 1,500 feet from the highway, the water-carved span of Natural Bridge requires a 4.8 mile round trip hike to reach, past forested scenery that while pleasant is less spectacular than the rockier areas further along the road. The trail follows a ravine (North Bonita Canyon), crosses a ridge, descends into the larger drainage of Picket Canyon then heads south through pine woodland to the bridge. Sarah Deming 1.6 800 The Sarah Deming Trail follows the south side of the namesake canyon, climbing steeply in places, passing a few rocky outcrops but mostly encountering thick woodland with only limited views of the wider surroundings. After crossing the streamway, the easternmost section ascends again, up to a junction with the Big Balanced Rock Trail. Silver Spur-Faraway 1.4 150 The west end of the Silver Spur-Faraway Trail is at the Faraway Ranch parking/picnic area, from where the path leads to the ranch buildings and a 1880s cabin, then enters more wooded surroundings, crossing Bonita Creek (dry in summer) and passing a medow lined by remnants of another old building. The east end of the path is beside the visitor center. Sugarloaf Mountain 0.9 470 Apart from a ridge along the northern boundary, 7,310 foot Sugarloaf Mountain is the highest point in the national monument, and the fire lookout tower on top may be reached by a relatively short trail that climbs the sparsely wooded slopes on the north side, then doubles back to the rocky, windswept summit. Upper Rhyolite Canyon 1.1 400 This trail follows the overgrown, boulder-filled streambed of Rhyolite Canyon for half a mile, climbing at each end to junctions with the Echo Canyon/Hailstone trails to the north, and the Sarah Deming/Lower Rhyolite Canyon trails to the west.